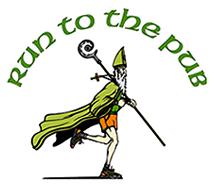 Thank you Run to the Pub for giving me such a grand adventure in Dublin Ireland! The day of the Run to the Pub half marathon, luck was on my side when my bib number was 777! I joked with my running buddy that there wouldn’t be a luckier number. The half marathon was a little more challenging because I had a sore throat and terrible cough. I had some real coughing spells that sounded like an old dog barking. These coughing spells didn’t keep me from running though. I took the course easy with light jogging and walking while coughing my way to the finish line. At the finish line, there was an energizing spirit in the air filled with music and excitement. Our group waited as we sipped craft beer and lunged for the t-shirts being thrown into the crowd from the stage. My bib number was the very first number called for the trip to Dublin. I was stunned! I couldn’t believe I had actually won. I yelled and screamed as I made my through the crowd. I felt like I was on the Price is Right, “Come on Down…”! My enthusiasm was through the roof! I smiled so much it hurt! 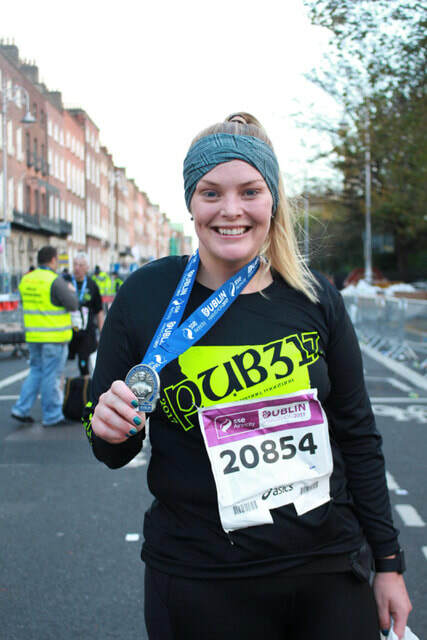 My husband and I arrived in Dublin on a Friday and the race was Sunday morning. The people of Ireland are the nicest people outside of the fine folks of Montana. Sunday morning had arrived, and the day was a real beauty, with clear skies and little to no wind. The streets were filled with 20k runners! At the start of the race a young woman told me, “Good Luck.” The energy of the spectators and crowd for the first mile was powerful! I ran near a woman and man in bedazzled bras (for breast cancer awareness month). I was passed by a man dressed as a toilet (lovely). Key tip: Always surround yourself around positive runners, who are excited and get cheers from the crowd. Good vibes are contagious, it helped to fuel my run watching them smile and wave to the crowd. This type of entertainment was a real boost during miles 11 and 22. As there were some steady climbing hills. At the top of the hill a man told me I was in heaven, and for that mile I created a mental illusion that running a marathon was heaven. I’ll never forget when I got to mile 25, my husband was there smiling and cheering me on. The last mile felt like the longest mile .2 of the whole darn thing! There was nothing better than hearing my name as I crossed the finish line threshold to gain the title of a” Marathoner”. Once I stopped moving continually my legs were hasta la vista babe! I learned from the Irish that the trick is to drink Guinness as soon as possible to avoid stiffness and sore muscles. I’ll certainly remember that advice for the next marathon. Thank you again, the marathon and trip to Ireland is a memory I will always treasure and look back on with great joy.